The First Chord Ukulele Orchestra is a fun and relaxed group based in the heart of Glasgow's West End! We run every Saturday from 5pm - 6.30pm from our spacious lesson space based in the well established CC Music Store. The group is open to all levels of Ukulele players from total beginners to experienced (don’t worry if you don’t have a uke, CC music has a excellent selection and we can guide you in choosing the right Uke for you!). Our tutor, Finn, arranges popular songs, that are often picked by the group, into several parts of varying difficulty. The sessions last an hour and a half and cost £10 (£8 student/concession) or £35 for monthly membership. Feel free to contact us on Facebook, 07809442272 or musiclessons@firstchord.co.uk to book or place or for more information! Sorry, but we have no upcoming events for First Chord Ukulele Orchestra. 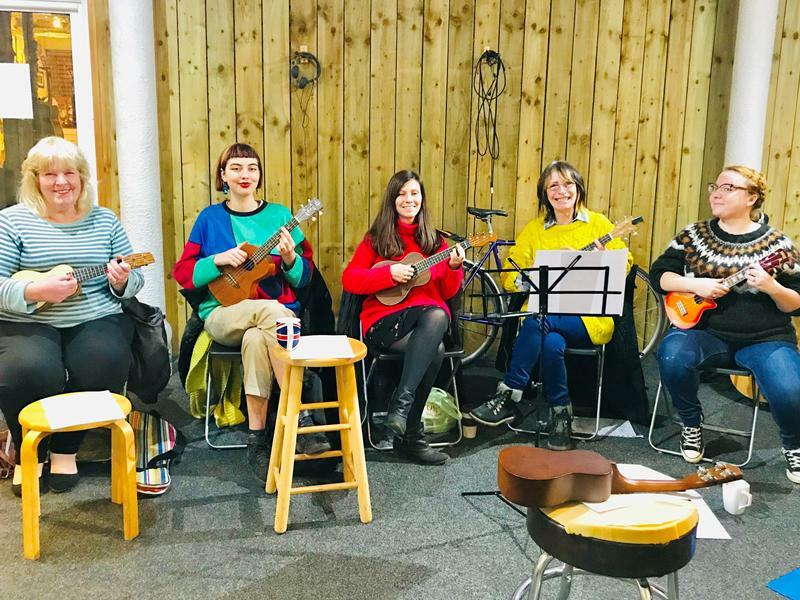 If you know of an event taking place at First Chord Ukulele Orchestra or anywhere else in Glasgow tell us about it and we'll list it on the website, for free! Clydebank Male Voice Choir D.O. We are a Male Voice Choir based in Clydebank in the west of the Central Belt in Scotland. Drum Tuition in the West End! Fraser Murray offers guitar Lessons for beginners, intermediate and advanced players in the West End of Glasgow. Jazz Choir Scotland offers classical and choral singers the opportunity to sing a wide selection of songs in a variety of Jazz styles and perform them regularly at concerts with live musicians. Learn to play the infectious rhythms of the Brazilian carnival at weekly Brazilian samba classes in Glasgow run by SambaYaBamba!